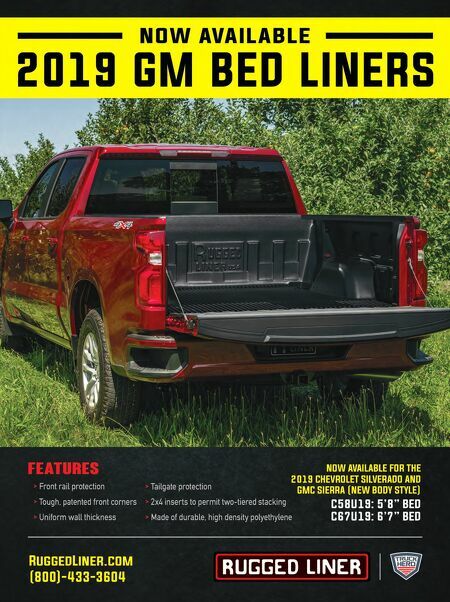 24 THE SHOP JANUARY 2019 "N ew body style??? … NOOOOO!" Have those words ever come out of your mouth when you learned that a highly cus- tomizable vehicle was about to be drasti- cally changed? For me, it has happened multiple times, and every time I thought it was the end. Then, to my surprise, another product or opportunity presented itself—sometimes with the newer version of the same vehicle. Take for instance the 2004 Ford Mustang. How many of you were really doing work on them? Maybe the motorheads were, but there wasn't much in the way of restyling. When the 1994 body style changed from the boxy look to the sleek new sports car, restylers and customers alike jumped on board. Then, as things tapered off, the 2005 drastic change back to the boxy look helped restylers again. My point is, things change—even when we don't think they should. But, change is good, and many times we don't realize just how good until much later. THAT'S DIFFERENT When Jeep announced that the Wrangler JK model was going away and would be replaced by the next-generation JL, you could almost hear the panic from shops and aftermarket parts manufacturers. For many years, the Jeep Wrangler has been an iconic vehicle that's attracted consumers from all walks of life. Whether you're single or married with a couple of kids, it works. If you pull up to your office where nothing but Mercedes and BMWs are parked, you still fit in! Not only are Wranglers popular, they are also among the easiest vehicles to cus- tomize. Each one is almost like a blank canvas, just waiting for the consumer to dream as big as his or her pocketbook will allow. The Jeep accessories business has been so large that it seemed like if you didn't have a Jeep at the SEMA Show with $30,000- $50,000 worth of products, then you weren't really in the Jeep business at all. Manufac- turers and shops have done extremely well in concept, design, production and profit- ability of Wrangler accessories. Bu t t h e n i t h a p p e n e d — M O D E L CHANGE! 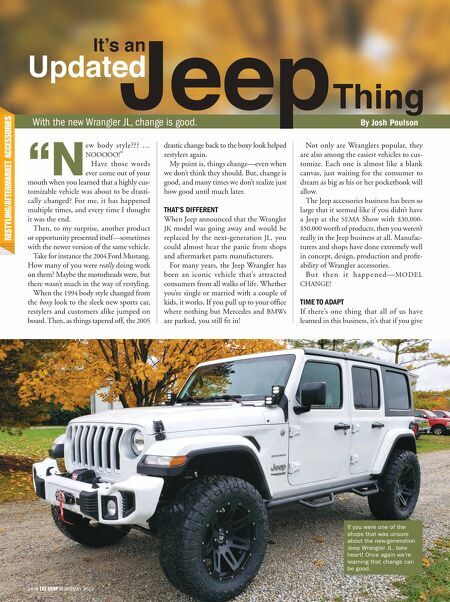 TIME TO ADAPT If there's one thing that all of us have learned in this business, it's that if you give With the new Wrangler JL, change is good. By Josh Poulson Jeep It's an Updated Thing 24 THE SHOP JANUARY 2019 If you were one of the shops that was unsure about the new-generation Jeep Wrangler JL, take heart! Once again we're learning that change can be good.